After mentioning him in the Roscoe Robinson post a couple of weeks ago, I figured the time was right to talk about Mister Jackson. 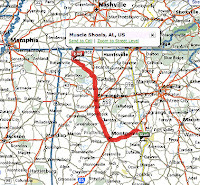 Ralph was raised in Phenix City, Alabama, a rough and tumble neighborhood just across the river from Columbus, Georgia. Growing up in the same house as his first cousins, Joseph and Fletcher Hewell, they were always 'banging on something' and making music together, whether in Church or as part of the marching band at school. 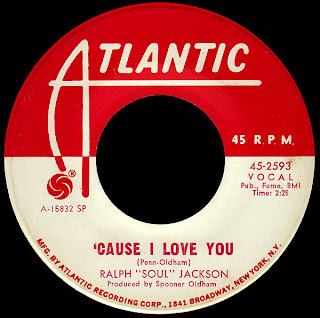 When Ralph was in his senior year, He wrote a song called Don't Tear Yourself Down and sent it off to Rick Hall up in Muscle Shoals. Hall called him back a few days later, and told him to drive on up. The year was 1967, and Fame was in its prime. The incredible soul music that was emanating from the studio was all over the radio. Young Ralph was kind of surprised to see that the guys that were playing on most of those records weren't much older than himself. The keyboard player, one Spooner Oldham, and he hit it off right away, and they set about recording his song, along with a cover of Hank Williams' Jambalaya for the flip. 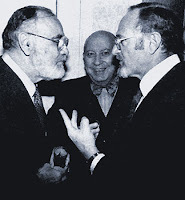 All of this was going on soon after Jerry Wexler had had his famous falling out with Rick Hall. Another New York 'record man', Larry Uttal, was only too happy to step in. Uttal had taken over Bell Records in the early sixties, and was having some success in the southern market through his arrangement with Allen Toussaint and Marshall Sehorn (most notably with Lee Dorsey on Bell's Amy subsidiary). In 1966, much to Wexler's chagrin, Uttal had made a 'handshake deal' with Papa Don Schroeder that had landed great records Schroeder produced at Fame (and later at American) on James & Bobby Purify and Oscar Toney Jr. with Bell. Dan Penn had already left Fame by the time Ralph had gotten there, and Spooner was about to join him at American in Memphis. All of this, I'm sure, led to Ralph's single (Amy 11002) being placed with Uttal instead of Wexler. Bell, however, never quite had the 'juice' Atlantic had down south, and couldn't promote a record the way the larger company did. That, coupled with the fact that, for some reason, they had decided on Jambalaya as the 'plug side', basically killed the record's chances. In the meantime, Columbus dee-jay Ed "Dr. Jive" Mendel had started his own record label, and reached out across the river to sign Ralph's cousin Joe, now known as Jo-Jo Benson. Benson's first single, Kiss Tomorrow Goodbye made some local noise, and paved the way for his later big hits with Peggy Scott. 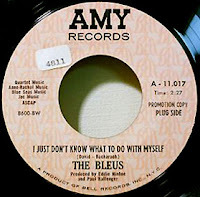 Mendel would then sign cousin Fletcher (now calling himself Fletcher Flowers) as well, releasing the ultra-rare deep soul ballad Comfort Me Baby on his new Peggy-Sue imprint in 1968. Spooner Oldham, meanwhile, hadn't burned any bridges, and was back at Fame ready to produce his friend Ralph's next record (the one you're listening to now) in 1969. (As you may have noticed, Wexler made sure he got this one before Uttal did.) This lesser known Penn-Oldham B side just cooks along... I'm loving the acoustic guitar, and those oh-so Dan Penn lyrics - "You told me you needed the brand new Cadillac, come on here and looka-now baby, there's one parked right out back!" Cool, man. The flip is a cover of Sunshine Of Your Love. Yes, that Sunshine Of Your Love. You have got to hear this. Really. I put it up on the A side. It will blow you away. 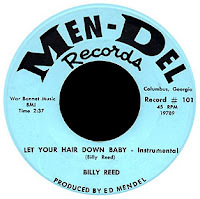 It was Ed Mendel that introduced Ralph to Neal Hemphill in Birmingham, and was instrumental in placing the next single he cut at Fame (in 1971) with Hemphill's Sound Of Birmingham label. By the latter half of the seventies, Rick Hall had begun concentrating on Pop and Country, and Jackson decided to cut his next record in Birmingham at Hemphill's studio. 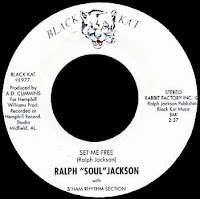 The resulting sides Set Me Free and Take Me Back were released on the Black Kat label in 1977. Lucky for us, they've recently been re-issued, both on a genuine vinyl 45, and as part of the amazing Birmingham Sound CD we've enthused about in this space before, brought to you by John Ciba and his Rabbit Factory. Great stuff. In the early eighties, Ralph started up his own RAJAC and Black Stallion labels, eventually building his own studio in his backyard. He's also gone on to become the 'music minister' of his Church, and the best damn auto mechanic in Phenix City. 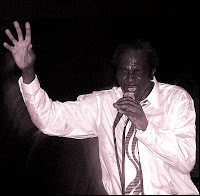 As we've talked about before, Ralph "Soul" Jackson has begun performing again in the wake of the Birmingham CD, and by all accounts has been simply fantastic! He's scheduled to appear at the Ponderosa Stomp in New Orleans next month. Thanks also go to Flickr member E.cheevo72 for the cool photograph of Mr. Jackson. You put so much information and love into these posts. I've been reading everyweek! I'm just a kid who loves music and vinyl but who knows not nearly enough about anything, so this is all brand new and fantastic information! I'm glad people like you exist, and are putting the internet to decent use. All these songs are such gems. Thanks again for sharing. Well thank you, Juliette. It's comments like yours that make it all worthwhile.